In Division 4, it’s Longford and Offaly who continue to lead the way. 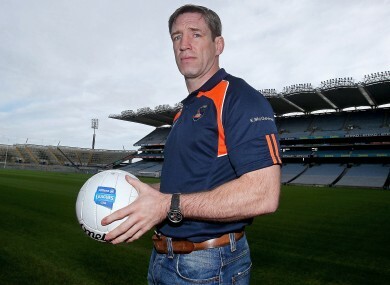 Armagh manager Kieran McGeeney saw his side win again today. ARMAGH AND FERMANAGH remain on course for promotion to Division 2 of the Allianz football league after both sides claimed victories in today’s Division 3 clashes. With just two rounds remaining, the pair can clinch promotion if they win their next games against Louth and Wexford respectively on the weekend of 28-29 March. Armagh ran out six-point winners away to Clare in Ennis this afternoon while Fermanagh had nine points to spare at home to Limerick in Enniskillen. Tipperary kept up the pressure when they won a seven-goal thriller against Louth in Drogheda today but it is the Ulster pair that are currently in the driving seat. Armagh defeated Clare by 3-11 to 1-11 in a game where they were in front by 2-8 to 0-4 at the break. Ethan Rafferty and Tony Kernan struck their first-half goals but Clare bounced back in the second-half with Pat Burke hitting their goal while U21 Jamie Malone finished with 0-3 from play. But Kernan’s second goal of the game helped seal Armagh’s victory. Fermanagh defeated Limerick by 2-19 to 2-10 with Sean Quigley grabbing 0-11 while Ruairi Corrigan and Eoin Donnelly supplied the goals. Robert Browne and David Ward fired home Limerick’s goals. Tipperary emerged 4-16 to 3-11 victors over Louth in Drogheda. Conor Sweeney, Philip Austin, Liam Casey and George Hannigan bagged the goals for Tipperary while Derek Crilly shot a hat-trick for Louth. The last game of the day was in Markievicz Park where Sligo eased their relegation fears with a 2-10 to 1-8 win over Wexford. Mark Breheny and Adrian Marren hit 1-3 apiece for the winners while Tiernan Rossiter scored Wexford’s goal. In Division 4, it’s Offaly and Longford that lead the way after they triumphed yesterday. Offaly enjoyed a narrow success over Carlow while Longford won by six points away to Wicklow. They’re both now on nine points at the top of the table with Longford just edging it on scoring difference. Antrim, who triumphed away to Waterford today, are back in third on seven points while Carlow are in fourth on six points. Longford entertain Offaly in the next round while the final round matches on 5 April could also be crucial as Carlow take on Longford while Offaly are at home to Antrim. Email “Armagh and Fermanagh keep up promotion bid as Tipperary win seven-goal thriller”. Feedback on “Armagh and Fermanagh keep up promotion bid as Tipperary win seven-goal thriller”.